Once they are in the pool, you simply reference the options for each product, picking and choosing which options you want to add, and the finer details like price, weight, etc for each individual option value. 8. Choose the Option Value, stock, price, weight, etc that you want for that product. Since “Color” is generic enough, you can reuse that option for other products. Shirts, Hats, etc without re-adding it to the options page. Just edit the next product and start typing “Color” again into the box with the green + icon and add it there with different pricing, qty, etc. – if at a later date you need more colours simply add them to the same color option and they will then be available in the product area. Use this for other options that are similar between products ie sizing. 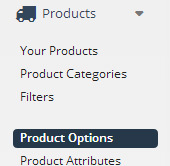 Remember you should not create a unique option for each product unless it really needs it. If you do it will get very confusing and very messy. If you need to add both a colour option and a size option to your store get in touch. We do have a more advanced Multiple Option module that can be added to your store for a one off setup fee.